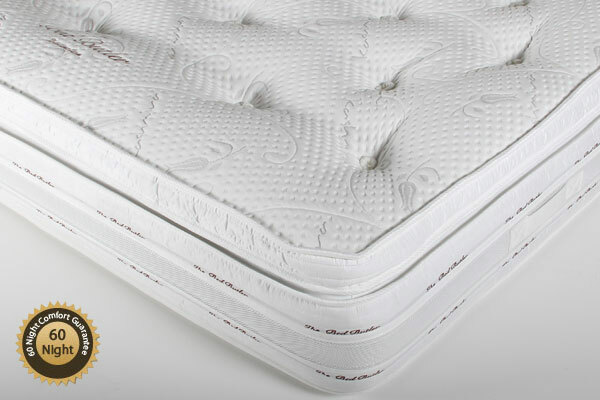 The Bed Butler Distinction combines the outstanding advantage of using Pocket springs, Reflex foam and Memory Foam. This beautifully designed Distinction memory foam extra deep mattress has been designed to provide luxurious comfort and absolute luxury. This 34cm deep mattress includes two layers of body contouring memory foam which work in harmony with 2000 individually pocketed springs to provide and maintain perfect support. The mattress has 25mm of memory foam together with 25mm of Reflex foam. This deep layer of Memory foam combined with the 2000 pocket springs provides ultra support and delivers an immediate sense of comfort and a consistent level of pressure-relieving support throughout the night. The instant-response of the memory foam to the your weight and shape, and the harmony maintained with your body by the pocketed springs, ensures that you feel the benefit and comfort of the bed’s support system from the moment you get into bed to the time you get up. The super soft Stretch Kashmira Fabric cover together with the 3D breathable branded boarder helps to regulate your body temperature, dissipating moisture and maintaining optimum warmth and comfort while you sleep. The memory technology fillings, held securely in place by large woollen tufts, provide an exquisite feeling of comfort and support. The mattress does not need to be turned but only changed top to tail at regular intervals. This Distinction Memory foam mattress is guaranteed to give you a supportive and comfortable night`s sleep. The mattress does not need to be turned but only changed top to tail at regular intervals.